90% of European citizens say they would expect help from other EU countries if a disaster struck in their country, according to a recent poll. Over 900 experts are meeting today in Brussels to discuss how European countries can best be prepared and respond together to natural and man-made disasters. The European Civil Protection Forum is the largest public event on civil protection cooperation in Europe. A biannual event, this year's Forum focuses on 'Partnership and Innovation'. Civil protection and disaster management experts coming from all corners of Europe share their experiences and define new ways to enhance collaboration. In the context of the Forum, the results of the latest Eurobarometer public opinion survey on civil protection are also released today. Figures show an overwhelming and growing support among Europeans for EU action in civil protection, and confirm citizens' continued solidarity with victims of natural and man-made disasters in Europe and around the world. “European citizens agree that coordinated EU action in dealing with disasters is more effective than having any country acting alone. The figures tell us that Civil Protection is at the very core of the European project. It is about assisting and protecting citizens when a disaster hits,” said Christos Stylianides, EU Commissioner for Humanitarian Aid and Crisis Management. Only 37% of Europeans believe that their home country has sufficient means to deal with major disasters, while 80% say that coordinated EU action is more effective than actions undertaken by individual countries. Through the EU Civil Protection Mechanism, which provides the framework for European countries to jointly respond to emergencies, European countries addressed well over 200 requests for assistance since 2001, including for the recent earthquake in Nepal. Eurobarometer surveys monitor the evolution of public opinion in EU Member States. More than 28 000 European citizens from all 28 Member States took part in the 2015 survey on Civil Protection. 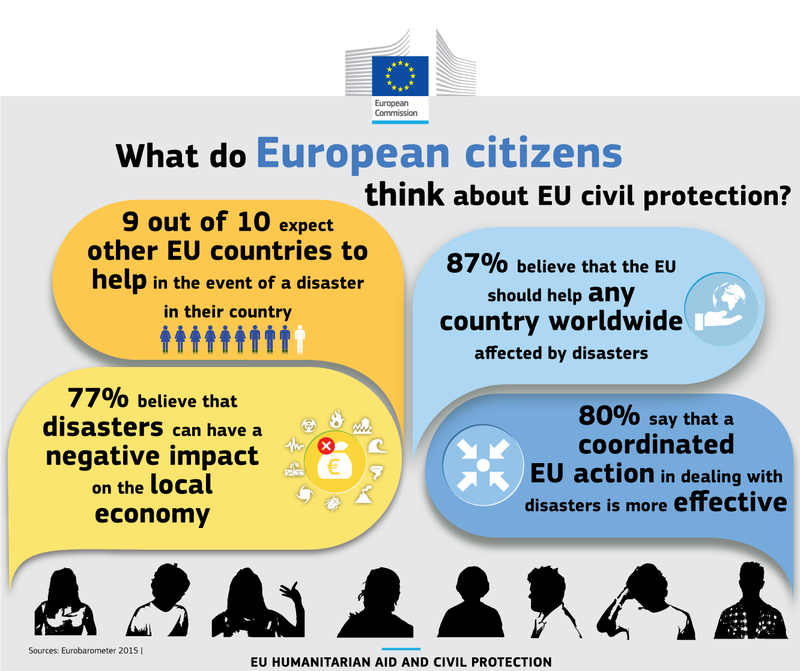 According to the figures, a large majority of EU citizens support European collaboration in disaster management.